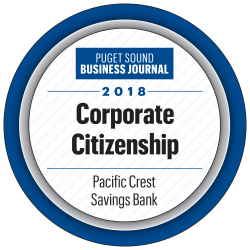 Pacific Crest is proud of our role as a community bank, and we take that commitment seriously. Whether we’re assisting children’s causes and organizations like Clothes for Kids and Seattle Children’s, or helping Jewish Federation of Greater Seattle, and Housing Hope support our neighbors, we are dedicated to assisting those around us. Learn more about the community organizations that Pacific Crest is a committed supporter.